You might want to assign a chat to another team member if you need help, or if you’re done chatting for the moment. 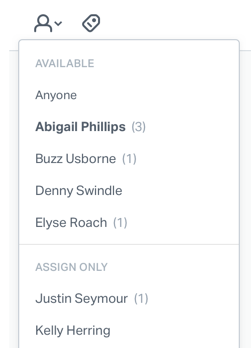 To assign a chat, click the Assignee icon, then select a new assignee. You can assign the chat to Users who are Available, or Users who have their status set to Assign Only. Only one User can be assigned to a chat at a time. Users viewing assigned chats are able to add private notes in real time, but they cannot reply to the customer. Once a chat is assigned, it cannot be sent back to Unassigned. You can only assign the chat to another User, or close it out if you're done chatting. The number in parenthesis next to the User's name indicates how many chats they're assigned to.